The numerical model of subclavian artery cannulation during cardiopulmonary bypass was validated experimentally with an in vitro test rig. 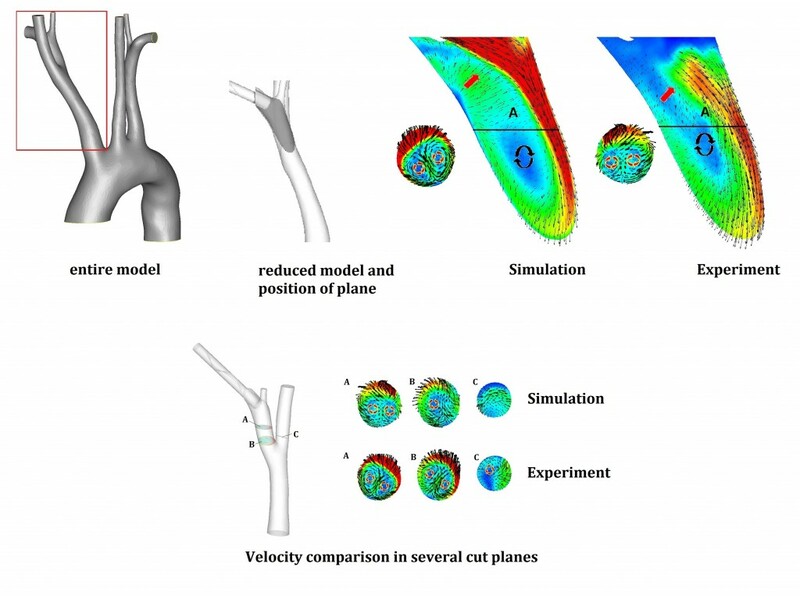 Stereo-Particle Image Velocimetry (PIV) measurements were used to reconstruct the three dimensional flow field and were compared to CFD results in distinct cut planes of the geometry. The velocities of simulation and experiment are in the same range. The vortices and areas of secondary flow are in the same location and therefore yield a qualitative validation of the numerical model. Validation results of the numerical framework. The area at the cannula outlet is examined in longitudinal and transversal cut planes.